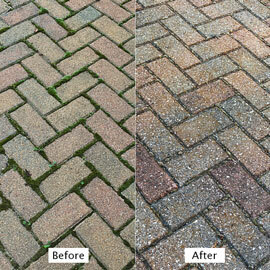 Q. I've been searching for a responsible way to keep my very large brick terrace free of weeds. (I will not use Roundup.) All the advice I can find is about weeds in garden beds or lawns, not growing up between bricks. I tried pulling the weeds out by hand after a good rain but they keep returning. Instead of pulling, think about using the loosening power of water without your needing to get physical. VERY sharp streams of water—like from a pressure washer—will blast out the existing plants and blow out the soil and bits of schmutz in the cracks that allow new weeds to germinate. And it'll keep the bricks nice and clean…. Newbie's email continues: "I've had some success with a home-made weed killer using horticultural vinegar but the weeds always come back." Vinegars labeled as 'horticultural' have a much higher level of acidity than grocery store vinegar. (Typically, 8 to 20% acidity versus the store bought 5%.) Used on a hot and dry day, they are very effective at killing any plants they soak. But they work best at full strength; not in home-made mixtures. And be careful! You must wear eye protection and keep children and pets away from the area while you're spraying. Vinegar isn't toxic, but you don't want to get any in your eyes. …Which leads me to suggest one of the newer iron-based herbicides as a much safer choice. 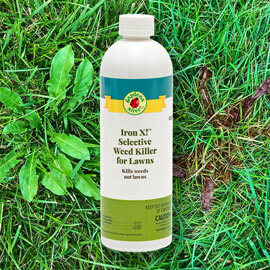 (And from what I hear from our listeners, iron-based herbicides are easier to find both online and at retail.) Look for the letters HEDTA or FeHEDTA as the active ingredient on product labels. 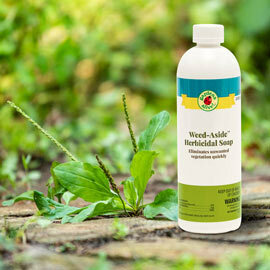 Herbicidal soap sprays are another option; just be sure to spray when it's hot and dry, and then rinse the area down the next day so it isn't slippery. We now conclude with Newbie's final email's comment: "Would it prevent new weed growth If I apply horticultural vinegar to kill the surface weeds followed by an application of corn gluten meal?" My answer is the one I was always told not to use back when I was a manager of a large staff of people: "Yes, but…". At any rate, instead of fighting Nature head-on, consider deliberately growing attractive and useful plants in those gaps. There are at least two lines of branded plants sold precisely for this purpose: "Stepables" and "Jeepers Creepers". (I don't name them, folks; I just report them.) Some of these plants are sold as potential lawn replacements, but a good number are tough and low-growing gap-filling wonders; including some that are fragrant when you step on them. The plants involved aren't exclusive to those companies, but the brands have done a lot to promote the idea of using plants in these kinds of problem places; and you can do a lot of preliminary research on your potential choices just by searching each company's offerings online. Then buy them wherever you want. But wherever you eventually purchase the material, the best answer to this problem is to plant low growing perennial groundcovers. Low growing sedges and sedums—the latter the anchor plant of green roof systems—are also great for this use, as are many other plants. So do your research, plant in the spring and weed no more!